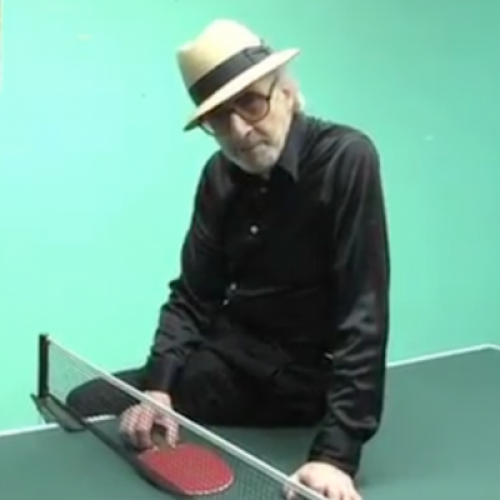 Yesterday, Marty Reisman, one of the greatest ping pong players of all time, died at the age of 82. In an essay from Jewish Jocks, a new book about important Jewish sports figures edited by TNR’s Franklin Foer and Marc Tracy, novelist Howard Jacobson looks back on the career of a phenomenal athlete and a romantic evangelist for his game. When I first met Marty Reisman—the best table tennis player America has produced and the sport’s greatest ever showman—he was carrying the story of his life, in press cuttings, on his shoulder. He pulled out of his bag an ordered sheaf of the most laudatory reports of his victories, photographs, interviews, news stories, some of them dating back fifty years. “You are a portable library of yourself,” I told him. He nodded, assuming that meant I wanted to see the rest. I say he nodded, but he wasn’t in fact listening. Marty Reisman is the politest of men but he doesn’t do listening. Time’s running out and he doesn’t want to waste what’s left of it on what you’ve got to say when he has so much more important information to convey, such as who he has just beaten and whom he didn’t beat but should have beat and whom he intends to beat. The occasion of our meeting was the World Veterans Table Tennis Championships, held in 1998 in Manchester in the north of England. I was there researching a novel, reminding myself of a game I had briefly given my life to, and Reisman was there to show the world that at sixty-eight he was still as good as anybody. Of the many differences between us, the two most salient were that he was a great player and I had never been, and where I had given table tennis up at an early age to do other things he didn’t think there were any other things to do. You are probably not going to be a great sportsman unless you are an egomaniac and an obsessive. Reisman has always been unapologetically both. But the press cuttings speak of more than self-engrossment. Reisman’s a storyteller on an epic scale, and a good epic is necessarily voracious, gathering everything to it, refusing no detail, admitting no irrelevance. Another way of putting it is that Reisman is seamless to himself and is going to have to be seamless to you if you are going to get him. He was a table tennis player because he was gambler and a gambler because he was a table tennis player. A writer the same. Ditto a showman. Yes, you need to see him play if you are to appreciate his genius, but seeing him play doesn’t in itself explain why he plays. Circumstance has made his playing career a sort of crusade for table tennis—for table tennis played in a particular way—but you feel that even had circumstances been different he would have had to adopt a table-tennis-related cause: to play wonderfully, of course, but to play wonderfully for a reason. The determining circumstance of Reisman’s career, anyway, was the 1952 World Championships in Bombay. And if that seems a long time ago, to Reisman it is as yesterday. In 1952 Reisman was a brash, lanky twenty-two-year-old New Yorker, in trouble with the authorities, a maverick and a k’nacker, with the table tennis world at his feet. Three years earlier he’d defeated the great Victor Barna in the final of the English Open and was now widely tipped as one of the young players most likely to win the world title in Bombay. But he didn’t. The person who did was a hitherto unknown Japanese player called Hiroji Satoh: studious-looking, unflappable, mysterious, and as much bewildered by his own success as anybody else. Notably, he wielded what looked and sounded like a small rubber mattress. From that moment, table tennis changed ineradicably: the sponge racket took over from the hardbat, the game became faster and more subject to the diabolic spin that sponge was able effortlessly to impart, little by little the power center of table tennis shifted from Europe and America to the Far East, and Marty Reisman turned into a fanatical purist. You don’t know you’re a purist until you discover an impurity in something you care about. For Reisman that impurity was the importation of new technology where none was needed. If it isn’t broke, don’t fix it, and table tennis wasn’t broke. It’s easy to read his response as Luddism predicated on sour grapes, but however one describes his initial responses to his own unexpected defeat, Reisman has, for over half a century, expressed his detestation of sponge in the language of the impersonal critic—one might even go so far as to say in the language of the moralist. Sponge, by his reasoning, changed table tennis for the worse because it silenced it, because the deadened soundlessness of sponge on ball took away not simply the musicality of the game but its conversational quality. Previously, each player responded to the sound as well as to the appearance of his opponent’s strokes, discerning intention as well as performance in them; dispense with the faculty of hearing and you make the game less subtle, less a test of intelligence. Until then, table tennis—which Reisman was once happy to hear me describe as chess in shorts, allowing that he was never a wearer of shorts himself—had been as much a game of wits as a sport; its earliest champions had been deracinated Austro-Hungarian intellectuals, a good number of them Jewish, who found mental stimulus as well as a sort of consolatory, introspective melancholy in it. Reisman might not have been much interested in the melancholy—the garrulous side of being Jewish chimed better with his genius—but the challenge the game presented to him was from the start a challenge to his invention and acuity. If hearing was part of that, so was summing up the psychology of your opponent in the course of long, fencing rallies, working out his weaknesses while concealing your own; so was the generation of speed by timing alone (and Reisman was a master of sudden and unexpected acceleration); so was the coaxing of spin by dexterousness of hand rather than technology; so was finding angles and corners of that small table which the greatest player could make everywhere, by patience, ingenuity, and, yes, wit. The original bat, made of plywood coated with a thin sheet of pimpled rubber, wasn’t a secret weapon, it was simply the extension of your hand, and the hand was simply an extension of your intelligence. To Reisman, sponge was an extension of science. Disappointed and more than a little embittered, he left the competitive game to follow his show-business instincts, working as a warm-up act to the Harlem Globetrotters. What they could do with a basketball he could do with a ping-pong ball. Sponge had made a mockery of the game he’d known; now he would make a crueler mockery of it still. He played with the handle of his bat, with chair legs, with a fountain pen, with his spectacles. Had you challenged him to do so and put money on it, he’d have played you with his eyelash. As a career move it was brilliantly satiric and maybe self-punishing, but it kept the wolf from the door. He was never going to settle quietly into refereeing or administration. His temperament was too renegade. His was a tripartite genius: he analyzed the game better than any other player of his status; he brought to a generally pallid sport the vitality of vaudeville; he was a thrilling player to watch, not only by virtue of the power of his strokes but by his ability to enlist every spectator into the drama of his contests with his opponent, with himself, and with the gods. It was, and remains, as though whenever he was on the table his skin was see-through. Which meant there was no other player you wanted to watch more. What is wonderful to me is that the saga continues. He has reawakened an interest in hardbat table tennis—hardbat tournaments are now played across America—even though for all his devastating analysis of why the clocks should be put back, they never will be. He goes on arguing his case: were he your mother-in-law you’d divorce your spouse, were he a lawyer you would hire him. He goes on playing and goes on caring about winning. If you are his friend and living in a different time zone you know who is on the other end of the phone when it rings at four in the morning. It’s Marty telling you he has just thrashed his practice partner Steve and is playing better than he ever has. What else matters at four in the morning? From the book JEWISH JOCKS: An Unorthodox Hall of Fame. Compilation Copyright © 2012 by Franklin Foer and Marc Tracy. “Ping-Pong Wizard” © 2012 Howard Jacobson. Reprinted by permission of Twelve/Hachette Book Group, New York, NY. All rights reserved.